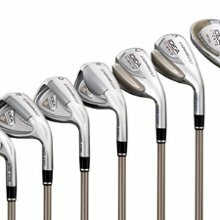 Idea a2 OS set features four progressively shaped hybrids integrated to fit perfectly into a set of irons. Designed to be the easiest to hit set of irons in golf. The center of gravity is 11% lower and 2.5 times deeper when compared to conventional irons. This allows the CG to flow evenly and consistently through the set and delivers high launch, increased distance & precise gapping. 30% higher MOI provides more forgiveness.